Each year, PPC Hero puts its highly esteemed list to the vote. 2017 saw Andi win the top spot in the PPC Rising Star category. Now, after another successful year for both Crealytics and its founder, you can support this campaign and help him win again! PPC Knowledge – Perhaps the most important characteristic, one has to understand PPC inside and out. Does this person properly know how to track Dynamic Search Ads? How about the factors involved in improving Quality Score? The PPC expert must know the intricacies of the industry. PPC Innovation – To truly be an expert, one must constantly be trying to improve the knowledge and ingenuity of the industry. Perhaps through a new ad copy test, a different way of looking at remarketing, or even thoughts and opinions on how AI is going to transform the industry, the PPC expert welcomes the challenge of the unknown. Awareness – How visible is the expert? In other words, how much information and opinion is the expert providing to the industry. This knowledge may come in the form of blog posts, webinars, speaking engagements, or even tweets. 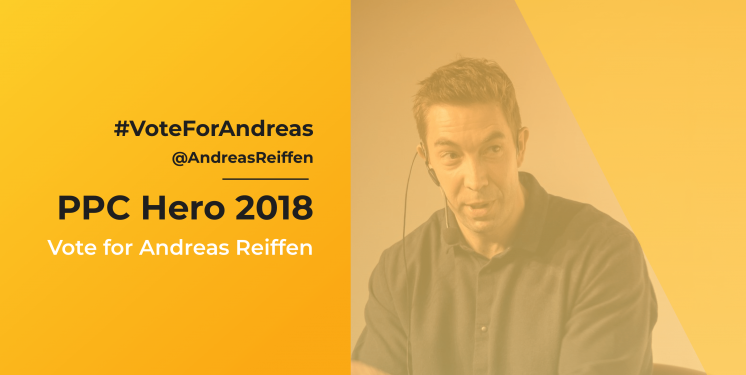 And feel free to share #VoteForAndreas on Twitter, LinkedIn or Facebook! Shoptalk Europe is one of the premier retail conferences in Europe. It focuses on the evolution of how consumers discover, shop and buy in an age of digital disruption. We can’t wait to be one of the more than 2,000 individuals, including 225+ world-class speakers, from across Europe and the world attending the event. My favorite part about ShopTalk is that it gives startups like Crealytics the perfect platform to speak to big retailers about how we can help them revolutionize the way their departments interact and share data. If you’re going to be at Shoptalk in Copenhagen this year and want to have a chat about the future of retail with me, drop me a line on ekaterina.dementyeva@crealytics.com, +49 151 14159600 or on LinkedIn. I’ll be floating around for the whole conference and would love the chance to speak to anyone interested the future of eCommerce! You can also check out what the Crealytics’ team has been up to at previous events here. Our team couldn’t be more excited to speak and exhibit at Shop.org’s 2017 Digital Retail Conference, which will be held September 25-27 at the Los Angeles Convention Center. Shop.org is the annual eCommerce conference for digital retail thinkers and doers! They’ve created a new immersive experience that blends insightful and actionable educational content, an easily navigable EXPO floor full of futuristic tech solutions and engaging new ways to expand your professional network. It’ll be a busy conference, but make sure you set aside 20 minutes to see our founder Andreas Reiffen give a tech talk on Breaking Down Silos in Marketing, Pricing, and Inventory at 9am on Wednesday 27th on Tech Talk Stage 4. Seattle, we are coming for you! Our team couldn’t be more excited to speak and exhibit at the 2017 SMX Advanced conference, which will be held June 12-14 at the Bell Harbor International Conference Center. This is a conference that cannot be missed, as the industry’s most prominent experts will be covering high-level tactics in search engine marketing. Yes, it gets technical. Yes, it’s invaluable. Don’t miss out! Be sure catch the team at Booth #51, and join us for some “SEMistry” at the Mad Scientists of Paid Search session with founder Andreas Reiffen, who had the opportunity to present Advanced Google Shopping last year. Ever wished you could sit down with the brightest minds in SEM and ask them all your burning questions? Yeah, us too. That’s why created our Crealytics eCommerce Cafe series where we get to pick the brains of some of the world’s most influential leaders in PPC. And now, we’re inviting you to get in on the action! Our next eCommerce Cafe will be a LIVE Q&A session with Paul Brett, Senior Google Shopping Specialist at Google. Because sometimes a little insider knowledge is just what’s needed to make a huge difference between winning and losing at Google Shopping Ads. It’s going to be an awesome night filled with drinks, coffee, dancing and the chance to ask one of the men behind the Google curtain what’s really going on back there. Format: While you’re tasting the finest in coffee beanery, Andi and Paul will answer your most detailed power-user questions, share better-than-best practices, and provide guru-level wisdom about what the future holds for Google Shopping and Feed-based Advertising. Music from Berlin-based DJ Marvin Hey will also be provided. We’d love for you to join us as we dissect Coffee Culture and Google Shopping in equal measure. Learn about the future of Google’s Feed-based Advertising Products even as you learn the nuances of Cortados, Cherries, Crema and Caffeine. There are ONLY 5 SPOTS LEFT! To claim yours, email your details to Andreea.khan@crealytics.com. At the end of October, we had the pleasure of attending Hero Conf London, the world’s largest all-PPC conference. There were great speakers, insightful talks and a lot of great takeaways. A few trends for the direction of PPC became clear as the conference wore on. Pretty much all the keynotes mentioned Machine Learning. Specifically, machine learning in the context of automating AdWords scripts. RLSA and audiences also drove a lot of discussion with several speakers stating that someone having interacted with your site or brand before is the strongest sign that they will re-engage and eventually convert and how that should drive your strategy. Google Shopping is a rapidly growing channel where Google only gives us limited direct control over where ads display. Hacks and workarounds were the main topics of discussion around shopping. We can’t cover all the interesting talks and content but we did want to share some details of a few of the keynotes and sessions we attended. Shopping – filter like your coffee depends on it! Last week at SMX East I was able to watch as one of my favorite minds in the industry, Kirk Williams of Zato, offered his ideas, best practices, and opinions on the state of PLAs and Shopping search. It was a fascinating session, full of great energy and equally great ideas. It’s no surprise to those that use our Camato Shopping Platform to learn that people clicking on Google Shopping ads are already all the way down in the search funnel. That’s why last click performance is so high and many advertisers allocate the major part of their PPC budget on Google Shopping. Last week Team Crealytics visited DMEXCO, the largest gathering of marketing professionals in Europe. With over 50,000 attendees and 1,000 vendors, it’s seen as the place to be if you’re in the digital marketing business. As a service for those that couldn’t attend (and as a summary for those that did), we braved the crowds to collect the most interesting content, thoughts and opinions that we heard over the course of the event. Last week I attended SAScon, a Search, Analytics and Social Media conference taking place for the 7th time and attracting over 350 digital marketing professionals (mainly senior). My aim was to get some insight into the relationship between PPC and SEO in the future and how it will be influenced by the technological innovations. Jim Banks from Groove – talked about how PPC has evolved since its beginning, gave examples of best practices and highlighted what the focus should be in the future; including cross device tracking, the growth of Bing, social and virtual reality. Banks also spoke about finding the “unicorn” keyword – that keyword that no one else has found, but which can become the most profitable one. He used an example relating to the increased interest in credit ratings seen online a few years ago. The unicorn keyword was “teletrack” – a large volume of users were searching for it, but hardly any advertisers thought to bid on it. It cost only 10cent. Banks said that he built his summer house off the back of this keyword. With Mobile continuing to grow (5.5 billion users predicted by 2020), there is increased interest in voice search. As such, the focus should be on long tail keywords – on predicting what users would ask search engines. Also, marketing efforts should be adapted to ongoing technological innovations such as virtual reality and augmented reality, which will influence customers’ online behaviour. Invest more in Bing and don’t just import duplications of your Google campaigns. In particular Bing Shopping Ads are growing in popularity due to the adoption of Windows 10, so there is increasing opportunity here. Was it worth the ticket? From my point of view, the conference had a great mixture of search, analytics and social related talks. It was interesting to hear best practices for different channels from digital marketing experts, as well as to gain insights on what the future will bring and how the industry will be affected.